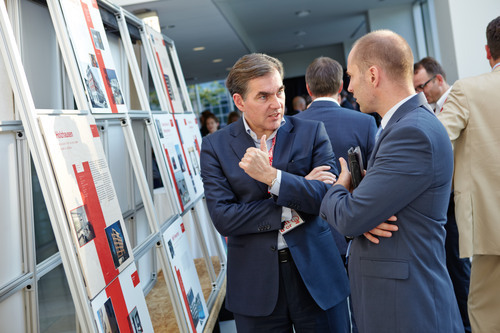 On July 10, 2014, swissnex Boston and the Swiss Federal Office of Energy (BFE) celebrated the opening of the new exhibition: Watt d’Or. In an exclusive, VIP event, Swiss Federal Councillor Doris Leuthard, and Northeastern University Provost, Steve Director, together inaugurated the world premiere of Watt d’Or in conjunction with swissnex Boston and BFE. 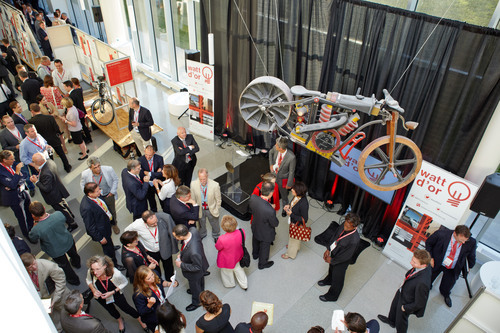 This as part of the roster of special events taking place during the Swiss-US Energy Innovation Days held from July 9th – July 12th, 2014 at Northeastern University. Watt d’Or showcases 25 of the 50 winners of the Watt d’Or award since the award program’s inception. Awarded annually by the Swiss Federal Office of Energy, the Watt d’Or recognizes the best energy projects and innovations from Switzerland. It is the most prestigious award in the energy sector in the country. During the reception, Councillor Leuthard, Provost Director, and Consul Moesner each delivered a speech to kick off the Swiss-US Energy Innovation Days and to celebrate the premiere of Watt d’Or. 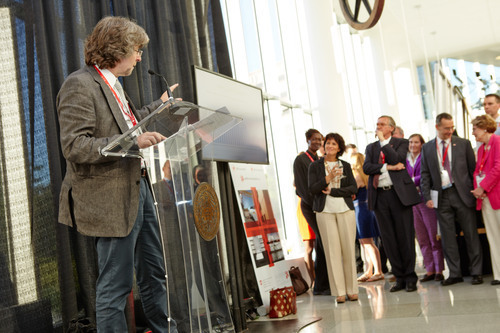 The reception also included brief presentations from 5 of the 25 Watt d’Or winners on display. More than 100 guests from the energy sector from both Boston and Switzerland attended the event. The exhibition will be on display at the International Village at Northeastern University until September 14, 2014. It will then continue on to other swissnex locations abroad.